What is the Way of Tea? What is a Tea Gathering? Shaded bushes for gyokuro, matcha and other high-quality teas. Frequently I have read about the process for making tea. But yesterday I had the chance to actually experience it for myself in a rural part of Kyoto, Wazuka Village. According to the literature of Wazuka, this village produces about half of the tealeaves for the world-famous Uji tea. Early in the Kamakura Period (1185-1333), tea seeds were brought to Japan from China. 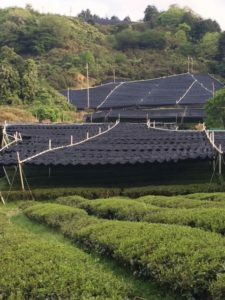 The soils and conditions of Uji were found to be suitable for the tea plants. As the beverage became more in demand, more and more land was used to cultivate these plants. 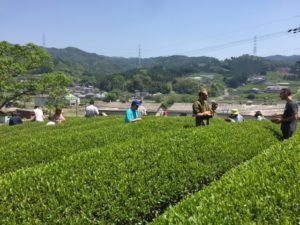 In the morning, as I walked along the river to get to Obubu Tea Farm for the tour, before I saw anything, I could smell the roasting of hoji-cha, or roasted green tea. I was surprised to see about 45 people gathered for the tour. Many Japanese, but also non-Japanese from other parts of Japan, Italy, France, Hong Kong, Switzerland and many other countries. The explanation was clear and provided in both English and Japanese. The first hour we spent in the tea field, picking the ideal tea leaves for green tea. 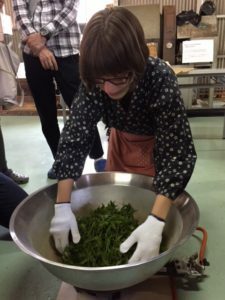 Then, we had tea-inspired bento lunch before settling earnestly into processing the leaves. We broke into groups and took turns heating the leaves in a large vat. We’d heat them to about body temperature. This is, we were told, enough to steam the leaves in their own moisture. Heating the tea leaves to steam them in their own moisture. We’d steam for a few minutes, then move to a table away from the heat to knead the leaves so that the moisture would be evenly distributed throughout the soft leaves and the firmer stems. 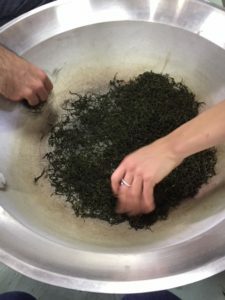 Kneading the tea leaves to distribute the moisture evenly throughout. When the tea-ball we were kneading felt drier again, we’d heat it again to continue the steaming, then knead it again. This was repeated several times. The goal was to keep reducing the moisture in leaves to a point where they were dry, but not brittle. After the final heating, we left them to air dry for a little while. In the end, naturally, we had a tasting session. The leaves were a beautiful, deep, deep green color, the fragrances was sweet and the taste was bitter. I think we ended up with a pretty good product, despite our lack of experience. For an interesting experience outside of the city centers, I strongly recommend a visit to this area. If you can go and you choose to stay in Wazuka, you definitely want to consider staying at the very clean, comfortable, reasonable and friendly Blodge Lodge. It is run by Michael and Ikuko Blodgett. The meals were delicious and the two young daughters made the stay particularly memorable. Every part of this 2-day adventure was a great success. I’m hoping to take some of my tea students there for another adventure! Simona’s excellent resource on tea. 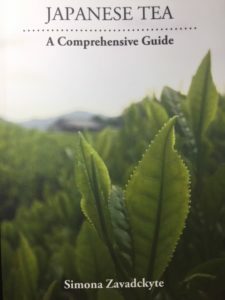 Also, if you want a good source of English information about Japanese tea, Obubu Farms has published a book by one of their staff members, Ms. Simona Zavadckyte. The book is “Japanese Tea: A Comprehensive Guide” and it is available on Amazon. It covers a wide variety of topics, from tea farming, to processing, type of tea and how to brew the teas. 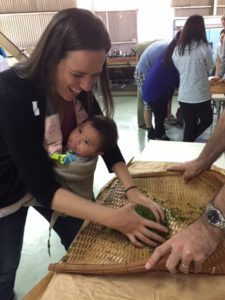 The website for all Way of Tea activities of Ms. Ruth Sōshin Lionberger. Urasenke lessons, lectures, demonstrations and more.